We organise a lot of excursions in NW-Russia. At the moment we are renewing our website and all excursions will be there. Please write us for more excursions and we will send you. 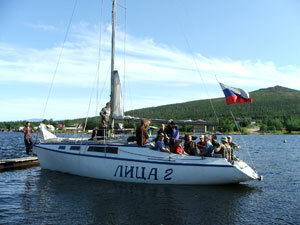 This sailing tour is going along the Imandra lake – the biggest one on the Kola Peninsula – 812 square km. There are a lot of different islands in the lake – about 114, and each of them is different by shape and landscape. The early morning sun meets you reflecting on the water of the lake shining between the passes and valleys of the eastern Khibiny Tundra. Enjoy the charm of the Northern Summer under the unsetting Sun! After breakfast hike to the start point of the tour – the Yacht club in Monchegorsk. Short introduction and accident prevention instructions. Sail on the lake among number of picturesque islands for two hours under guidance of an experienced instructor. When the tour if finished hike back to the hotel. yachting under guidance of a experienced instructor.